Finish: Double stitched leading edge. Folded soft edge hem & pocket. 5 layer tip points. Extra strong construction. Note: PSA-Pressure Sensitive Adhesive Tape or Hot Melt Adhesive may be used to 'tack' your pole pocket sleeve positions in small quantities suited for futher processing (sewing/binding) to your product/manufacturing choices via order page. The amount of tack used is minor. Hanging Displays, Banners, Fabric Posters, Store Displays, Conference, Expo, Exhibition, Carry, Suspend, Hang, Drape. NOTE: S B O do not supply poles or hanging brackets, wires or eyes. Your local hardware can supply poles/brackets etc. 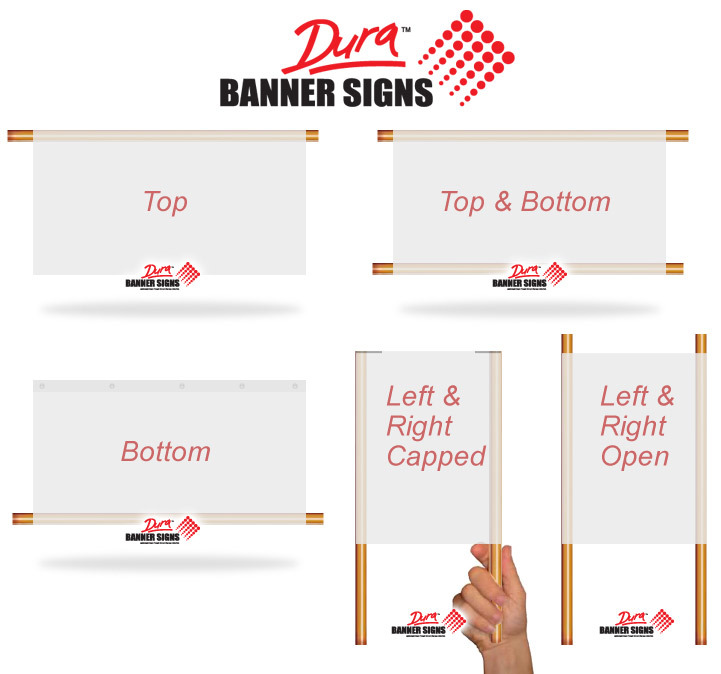 The number of applications for hanging a banner is wide and varied. For long spans we recommend you also use center wire system to prevent drooping, sway and excessive weight strain on the stitching. Do not design any size to be weight bearing. You must design a correctly fitting frame for any weight bearing or huge drape sizes. PSA: Rubberized pressure sensitive tape may be used to position your options via sewing/manufacturing stages undertaken and potential residue may be resulting. Do not remove as this may 'dirty' your print. Do not use mineral based cleaners or solvents on any printed items. POLE POCKET SLEEVES are used for display and convenience. Do not use for weighted objects. Pole Pocket Sleeves are double stitched along the leading edge and Folded soft edge hem & pocket.